The plants and the volunteers are ready! 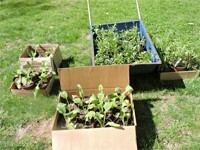 This year's plant sale on Saturday, June 3 from 7 a.m. to 11 a.m. is going to be better than ever. The library has an abundance of plants that are waiting to find homes. The sale offers everyone a chance to get some great plants for the flower and vegetable gardens at reasonable prices. Volunteers have been working hard since last fall to make this sale a standout. Donations received last fall were wintered over in the Community Garden and area growers have donated plants. The selection includes more than 400 plants. This annual fundraiser is important to the library and its’ ability to provide services to the community. Stop by and grab some wonderful plants while supporting the library. Additional donations will be accepted Friday, June 2 from 2 p.m. to 5 p.m.
Bridgton, ME ( May 16, 2017) Jon Evans, Loon Echo Land Trust’s (LELT) Stewardship Manager and LELT’s Biologist, Paul Miller met with Jeremy Stultz, of Integrated Forest Management, on May 16, 2017 to discuss Raymond Community Forest’s draft Management Plan. As the planning continues for Maine’s newest community forest, the Management Plan is a required part of the Land for Maine's Future (LMF) funding. LMF funding helped pay a portion of the purchase of the 356 acre preserve. With the recent forest cutting by the previous owner, Hancock Land Company, no forest management will occur during the 10 year life of the plan Loon Echo is developing. According to Evans, Loon Echo’s management goals for Raymond Community Forest include habitat, recreation and timber management. The emphasis of the timber management portion of the plan focuses on wildlife habitat, and diversity of species and age classes. Long term plan focuses on developing late successional, otherwise known as old growth forest, on a portion of the preserve. Visual impact on the iconic Pismire Bluff is also included in the plan. The overall Management Plan for the 356 acre parcel calls for free public access for non-motorized recreation including: walking, hiking, bird watching, hunting and general enjoyment. Loon Echo has already opened up the Forest with three new trails, including a trail to the cliff known as Pismire Bluff. A parking area on Conesca Road in Raymond was developed late in 2016 for the public to access the area. Loon Echo’s biologist, Paul Miller is developing interpretive educational signs along one of the newly constructed trails. Loon Echo Land Trust, a membership supported organization, protects nearly 6,700 acres of land and manages 31 miles of multi-use trails in the northern Sebago Lake Region. Its mission is to work with the local residents to conserve the region’s natural resources and character for current and future generations. Loon Echo works within its service area to safeguard water quality, preserve viewsheds and provide outreach and fun educational programs for the public. Loon Echo assists landowners to take steps to ensure future generations will benefit from the preservation of their lands. For information about upcoming events or ways you can support Loon Echo Land Trust, go www.lelt.org or call 207-647-4352. 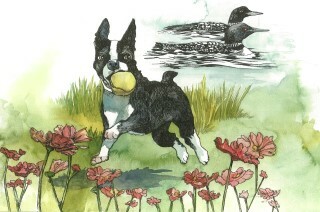 Barely six months after the release of her first children’s book, “The Boston Terrier Who Thought He Was a Loon”, Raymond author Michelle Patch, illustrator Thomas Block and design artist David Allen, have won the prestigious Excellence in Graphic Arts Award at the New England Book show – held earlier this month at Boston Symphony Hall. Jane Karker, president of Maine Authors Publishing (MAP) accepted the award for Patch, who could not attend the event. Karker proudly acknowledged that, in its 16 years, it was the first win at the Book Show for MAP. The event, founded by Bookbuilders of Boston, is in its 60th year and was established as a nonprofit organization to exchange information and promote improvements in the quality of books. Finalists are selected for the quality of design and production. As reviewed in The Windham Eagle (Feb. 24, 2017), “The Boston Terrier Who Thought He Was a Loon” tells the story of the Patch family dog who tries to befriend a group of illusive loons who live on Thomas Pond in Raymond, Maine. With its themes of friendship and sense-of-place, the book already has demonstrated appeal with young readers. And just as music melds with the lyric, WOW defines good children’s literature as “…an exquisite weave of both words and images. It appears The New England Book Show felt “The Boston Terrier Who Thought He Was a Loon” passed that test.